Jerusalem saw the highest rise in tourism this year, according to a survey of the world’s most popular tourist destinations published this week by U.K.-based market research company Euromonitor International. According to the company, 4.8 million tourists are expected to visit the highly revered—and contested—city, 38% more than in 2017. For daily updates, subscribe to our newsletter by clicking here. According to the Israeli Ministry of Tourism, the number of international tourists who entered Israel this year stand at around 3.8 million and is expected to be over 4 million by the end of the year. These figures represent a 15% increase in tourist to the country compared with 2017. Based on annual average, 85% of these tourists have visited Jerusalem. Calcalist has approached Euromonitor International for a comment on the discrepancy between the company’s data and the data collected by the Israeli tourism ministry and has yet to respond. Euromonitor did not specify its data sources but said its ranking is based on international tourists visiting a city for at least 24 hours and no longer than a year, and excludes domestic visitors, same-day visitors, people in transit, military personnel, and transportation crews. Jerusalem’s rush in popularity, which Euromonitor said was aided by relative stability in the country and significant marketing efforts, places Jerusalem in the 63rd place on the list of 100 most visited cities in 2018. With nearly 30 million tourist, Hong Kong is the most visited city in 2018, followed by Bangkok, London, and Singapore. Globally, Euromonitor reports an increase of 5% in global tourism in 2018, with 1.4 people having traveled internationally. 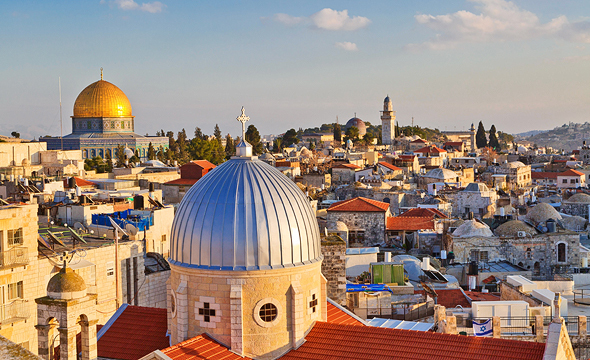 Israel’s largest city, Jerusalem is considered one of the world’s most prominent historical and religious destinations, bearing deep symbolic to people of Jewish, Muslim, and Christian faiths. One of the oldest cities in the world, Jerusalem is home to the Western Wall, Al-Aqsa Mosque, and the Church of the Holy Sepulchre. Both Israel and the Palestinian Authority consider Jerusalem their capital. While Jerusalem is the de facto capital of Israel and the seat of Israel's parliament, supreme court, and the official residences of Israel’s prime minister and president, the Palestinian designation is more symbolic than practical. In December of 2017, U.S. President Donald Trump signed a declaration officially recognizing Jerusalem as the capital of Israel and resolving to move the U.S. embassy to the city, provoking a wave of protests and riots among the Palestinian populations both in Israel, in the Palestinian-controlled West Bank and Gaza.